JERSEY CITY, N.J. (AP) — Authorities say homicide detectives are investigating after a man was found dead with apparent head injuries in New Jersey. JERSEY CITY, N.J. (AP) — Authorities have made an arrest in the strangulation death of a woman whose body was found in the lake of a northern New Jersey park. JERSEY CITY, N.J. (AP) — A Jersey City councilman sprang into action to help revive a man who passed out during a City Hall ceremony. HOBOKEN, N.J. (AP) — A New Jersey city is considering regulating pub crawls to prevent taxpayers to have to foot the bill for the locally reviled events. JERSEY CITY, N.J. (AP) — Two increasingly crowded polling places in Jersey City under a proposal that would split two voting districts into four. MONROE TOWNSHIP, N.J. (AP) — A New Jersey township is seeking to improve the commuting experience into New York City with the help of a newly-formed council. JERSEY CITY, N.J. (AP) _ Bel Fuse Inc. (BELFB) on Thursday reported fourth-quarter net income of $4 million, after reporting a loss in the same period a year earlier. JERSEY CITY, N.J. (AP) _ Bel Fuse Inc. (BELFA) on Thursday reported fourth-quarter net income of $4 million, after reporting a loss in the same period a year earlier. JERSEY CITY, N.J. (AP) _ Mack-Cali Realty Corp. (CLI) on Wednesday reported a key measure of profitability in its fourth quarter. The results matched Wall Street expectations. JERSEY CITY, N.J. (AP) _ Verisk Analytics Inc. (VRSK) on Tuesday reported fourth-quarter earnings of $146.2 million. JERSEY CITY, N.J. (AP) — A New Jersey has ruled against the Jersey City police unions request to restart the off-duty jobs program. JERSEY CITY, N.J. (AP) — An appeals court has ordered a new trial for a man sentenced to 30 years in prison in a New Jersey high-rise slaying a dozen years ago. JERSEY CITY, N.J. (AP) — A 14-year-old boy who allegedly brought a loaded gun to a New Jersey elementary school is now facing weapons charges. But it's not clear why the teen had the gun or if he planned to use it. No injuries were reported. A resource officer reportedly found the gun Wednesday in his bag at the James F. Murray elementary school in Jersey City. The school serves pre-K through eighth-grade students. JERSEY CITY, N.J. (AP) _ Provident Financial Services Inc. (PFS) on Friday reported fourth-quarter net income of $35.8 million. The Jersey City, New Jersey-based company said it had net income of 55 cents per share. The results surpassed Wall Street expectations. The average estimate of three analysts surveyed by Zacks Investment Research was for earnings of 48 cents per share. NEWARK, N.J. (AP) — A man who swindled two investors out of $3.4 million by falsely representing that his businesses had secured lucrative contracts to sell olive oil to major retailers has been sentenced to more than three years in prison. Antonio Fasolino received a 37-month term Wednesday. He'll also have to pay $3.4 million in restitution. The 62-year-old Jersey City man had pleaded guilty last August to three counts of wire fraud and a single count of transacting in criminal proceeds. NEWARK, N.J. (AP) — The mayor of Newark is calling on the public to come forward to help solve the shooting that wounded four girls and women, one critically, during a candlelight vigil in the New Jersey city. Newark police said the victims, who range in age from 16 to 20, were shot at about 9 p.m. Saturday at a vigil near the scene of a double fatal crash. JERSEY CITY, N.J. (AP) — A suspect has been arrested and charged in a recent shooting at a New Jersey mall. The New York Road Runners are coming to New Jersey. The running club and Jersey City officials announced Tuesday they will host a new race, the NYRR Newport Fiesta 5K, in the city's downtown area on May 4. JERSEY CITY, N.J. (AP) — A new bar in New Jersey is defending itself against allegations that a dress code it displayed recently was aimed at people of color. The owner of The Ashford in Jersey City tells NJ.com that the placard was up for one day during the bar's soft opening in December and was "a mistake" and wasn't reviewed properly. JERSEY CITY, N.J. (AP) — One of the victims of a mall shooting last week in Jersey City has been arrested on an unrelated warrant. Jalil Holmes faces aggravated assault and weapons charges stemming from an incident Wednesday, two days before the shooting. Officials do not have attorney information for Holmes. JERSEY CITY, N.J. (AP) — Two people were shot in an altercation Friday night that began as a fistfight in the food court of a Jersey City mall and led to the building being evacuated, officials said. JESREY CITY, N.J. (AP) — Three teenage boys face charges in the shooting death of a high school student who was gunned down last month moments after he placed an order at a fried chicken restaurant. Hudson County prosecutors say a 16-year-old is charged with the Dec. 26 murder of Judane Holmes, while a 14-year-old and a 15-year-old are charged with murder as accomplices. All three boys also face weapons charges. JERSEY CITY, N.J. (AP) — Financial literacy courses are now required for New Jersey's middle-schoolers under a new bipartisan measure signed into law. Acting Gov. Sheila Oliver signed the measure Thursday in Jersey City. The new law goes into effect immediately and will apply for the school year starting in September. The measure requires the State Board of Education to incorporate financial literacy courses into the curriculum for students in grades six through eight. JERSEY CITY, N.J. (AP) — Two firefighters have suffered minor injuries while fighting a three-alarm blaze in Jersey City. WABC reports the fire started at about 9 a.m. Wednesday in the multi-family house on Garfield Avenue. The firefighters' injuries weren't immediately disclosed. Both were treated at Jersey City Medical Center. PLEASANTVILLE, N.J. (AP) — Authorities say a southern New Jersey man was shot and wounded in separate incidents that occurred on consecutive days in the same city, but he wasn't seriously injured in either shooting. JERSEY CITY, N.J. (AP) — Authorities say a New Jersey police officer shot and critically wounded a man armed with a weapon in the home of his parents. The Hudson County prosecutor's office says Jersey City officers were dispatched to the home on a report of "a violent emotionally disturbed male." Prosecutors say the officers tried to calm the 36-year-old man, who lived at the address with his parents, but their efforts were unsuccessful. JERSEY CITY, N.J. (AP) — A man who won New Jersey's lottery twice has been arrested on drug charges. Jersey City's council voted early Thursday to keep the Katyn memorial where it has stood for more than 25 years. The Jersey Journal reported the vote. KEANSBURG, N.J. (AP) — Police in Monmouth County say a deliveryman made some pickups he wasn't supposed to. Keansburg police charged William Tindall III with theft last week. 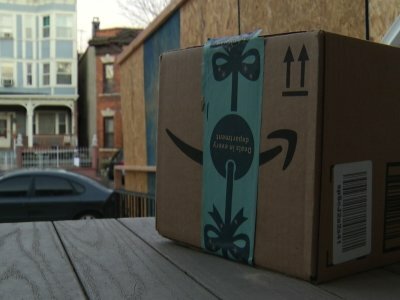 They say the 25-year-old Jersey City resident was working for Last Mile Delivery, an Elizabeth-based company that contracts with Amazon. JERSEY CITY, N.J. (AP) — Funeral services are scheduled for four children killed in a car crash in South Carolina this month. The Jersey Journal reports visitation and services are taking place Wednesday in Jersey City. Driver Arnez Yaron Jamison faces multiple charges stemming from the Dec. 7 crash. WESTWOOD, N.J. (AP) — What's the age limit on giving back? If you ask one centenarian, she'll say there is none. Anna Gizzi, who turned 101 this month, has been sewing blankets and hats for children at hospitals for years, most recently for the Good Samaritan Hospital in Suffern. NEW YORK (AP) — The Port Authority of New York and New Jersey says its World Trade Center train station will be closed on most weekends from next month through December 2020. The agency says it will be doing repair work on Hudson River tunnels and equipment severely damaged by Superstorm Sandy in 2012. PATH weekend service to the World Trade Center in lower Manhattan will terminate at the Exchange Place station in Jersey City. JERSEY CITY, N.J. (AP) — Details emerged in a pending settlement of a $400 million-plus lawsuit filed by the city of Jersey City against the Port Authority of New York and New Jersey over what the city claimed were unpaid taxes on dozens of properties. The city initially sued four years ago, claiming the bistate agency hadn't paid taxes, or had paid far too little in payments in lieu of taxes, on 40 properties over a span of many years. NEWARK, N.J. (AP) — A signal failure has suspended PATH trains in both directions between New Jersey and New York. The failure occurred early Tuesday afternoon. The Port Authority of New York and New Jersey says PATH tickets are being cross-honored by New Jersey Transit at New York Penn Station, Hoboken and stations in Jersey City and Newark. JERSEY CITY, N.J. (AP) _ Scynexis Inc. (SCYX) on Tuesday reported third-quarter net income of $351,000, after reporting a loss in the same period a year earlier. On a per-share basis, the Jersey City, New Jersey-based company said it had net income of 1 cent. Losses, adjusted for non-recurring gains, were 14 cents per share. The pharmaceutical company posted revenue of $64,000 in the period.